The Last Stand (Kim Jee-won) **1/2 - It's an Ah-nuld vehicle co-starring Johnny Knoxville and it's being released in January. What the hell am I doing seeing this? Well, it's directed by Kim Jee-woon, the Korean director behind I Saw The Devil, a pretty darn good (and crazy violent) action/horror flick. The plot is predictable, formulaic and derivative but a lot of it is undeniably fun (and outrageous and ridiculous). The film has the feeling of a rather old-fashioned '80s/'90s action picture along with the cartoonishly evil villains and strong violence. Kim's stylistic flourishes makes things a bit more interesting than it probably should. Not a bad time killer. Precious: Based on the Novel 'Push' by Sapphire (Lee Daniels) *** - Since it's Oscar season, I decided I will catch up on the few recent Best Picture nominees I still haven't seen, starting with this. I must say, right off the bat, I think the number of appalling misfortunes that the title character has endured is bordering on ridiculous, almost darkly comedic. Some scenes border on camp/parody and Lee Daniels' directorial choices aren't helping it very much. But what makes this film absolutely work are the performances of Gabourey Sidibe, Paula Patton and most especially Mo'Nique, who richly deserved her Best Supporting Actress Oscar. A few scenes involving these actresses tested the strength of my tear ducts. The Evil Dead (Sam Raimi) ***1/2 - Having seen and loved the sequels, I could have sworn I have seen this film. But as it turns out, I have not, at least, not all the way through. I think I've seen chunks of this when I was very young but not the whole movie. So naturally I thought I had to see this all the way through especially now that a remake is in the horizon. I have to say that it's a scary fun horror movie with over-the-top gore that's really fun to watch. The obvious low-budget nature of the film adds to its charm. The Impossible (Juan Antonio Bayona) **1/2 - Let's clear some things first: I didn't find the fact that they turned a Spanish family into British offensive or racist. I didn't mind that this is a story from the point of view of a fairly well-off Western European family and that it has a happy ending. It would've nice and would've been a lot better if the film didn't make it seem like the people who suffered the most are the white tourists and the Thai people were not mostly relegated to being the helpful natives which I found somewhat patronizing. But even then, the film is still somewhat a strictly by-the-numbers triumph-of-the-human-spirit type of film, well-made but cliched. It's redeemed somehow by newcomer Tom Holland's performance. He managed to add layers of growth and nuance in his character. It ALMOST made me want to forgive the film's flaws. Almost. Beasts of the Southern Wild (Benh Zeitlin) ***1/2 - This film is pretty much Brillante Mendoza meets Hayao Miyazaki for me. It's a pretty good combination. It's basically about a little girl and her relationship with her troubled father in the poor areas of Louisiana during, what I'm assuming is, Hurricane Katrina. The American poor here is depicted almost like its own subculture probably almost foreign to a middle-class city dweller. Personally, I have mixed feelings about over-romanticizing such things. However, the film is anchored by the wonderful performances by the two leads who are first-time actors (Quvenzhane Wallis and Dwight Henry) and I was unexpectedly moved by the ending. First-time feature director Benh Zeitlin shows talent and has a unique voice. Can't wait to see where he goes from here. Les Miserables (Tom Hooper) *** - Now this is another tough one. I'll say upfront that I love the musical (and musicals in general). Overall, I have to say that I did like this movie a lot. Some of criticism, however, I find myself agreeing with them: Tom Hooper's excessive use of close-ups (Tom, the medium shot is your friend), Dutch angles and off-kilter framing which, I think he mistakes for his "style" or "signature" ("visual crutch" is more like it) almost sinks the film. I've seen my share of all-singing musicals but this one felt a bit much despite the fact that I do adore the score. Despite all its flaws however the things it got right it REALLY gets right. The cast is pretty superb (Russell Crowe, IMO, isn't THAT bad, he's just not up to the standards of the rest of the cast). The big emotions (though a bit cheesy) of the original musical is present in spades here and for me, there's nothing wrong with that. It's a mixed bag but good overall. I apologize for not posting so much lately. I've been busy with other things. The announcement of this year's Academy Award nominations did not escape me though. This year, I have to say, it's a very strong slate of nominees. There's no nominee here that's as objectionable as say, The Blind Side or The Reader or even Extremely Loud and Incredibly Close. 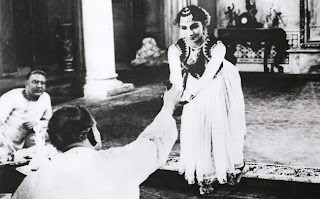 I'm also quite thrilled that the Academy nominated Amour. I reviewed this film about a month ago. It's a Michael Haneke film. It's his most accessible film to date, granted. But saying Amour is his most "accessible" is like saying The Island is Michael Bay's most artsy movie. It's still a challenging and brutal film. For the Academy to recognize its genius and giving Michael Haneke some mainstream attention, that's a triumph. Most people are talking about the "snubs" in Best Director, particularly that of Ben Affleck and Kathryn Bigelow but, I'm not quite as outraged as some people are. I'm just thrilled Haneke is nominated, haha. 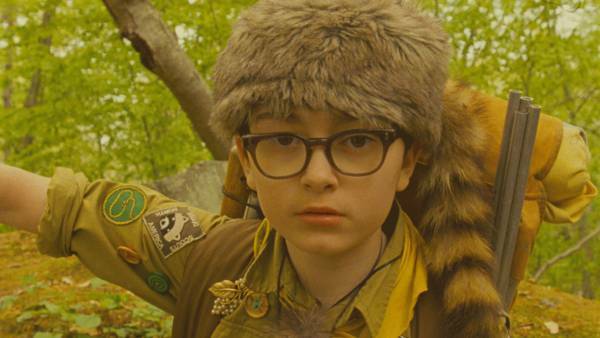 I personally would have loved to see Moonrise Kingdom get nominated for Best Picture and for Perks of Being a Wallflower, Looper and The Cabin in the Woods to somehow show up in the Screenplay categories, but, hey, you can't have everything. Zero Dark Thirty (Kathryn Bigelow) *** - This is an interesting conundrum of a film for me. On the one hand, it's extremely well-made and very well-acted. Jessica Chastain is magnificent and she's backed up by a great supporting cast especially Jennifer Ehle (who, IMO, injects a lot of relatable human flavor to the proceedings). The last 40 minutes alone is simply bravura filmmaking (including the unfortunately Oscar-ignored cinematography of Greig Fraser), that only a first-rate director like Kathryn Bigelow can do. On the other hand, the film just feels a tad too clinical despite all that. As for the pro-torture criticism, I don't see it. The film does not really take a clear moral stance either way but it does depict the brutality of it. I don't think the filmmakers should be crucified for it. I think it has moments of greatness but overall, I'm sorry if I'm damning it with faint praise, it's only a very good film not a GREAT one. Life of Pi (Ang Lee) ***1/2 - I've read and loved the book but I thought a film version would be a challenging task. It's not a perfect adaptation but it's about as close to perfect as one can get with the transfer from one medium to another. Director Ang Lee has made what really is an ambitious art film about faith and the big questions of life (like the existence of God and the meaning of it all) with a mostly unknown cast with big-budget CGI and 3D and the result is quite moving, thought-provoking and visually spectacular and exciting. The use of the 3D is among the most artful and effective that I have ever seen. The Petrified Forest (Archie Mayo) *** - A criminal gang holds a group of people in a "last stop" dive in the desert hostage. The film's plot is pretty routine and feels a bit like a filmed stage play than a movie most of the time. However, the terrific performances by the cast led by Leslie Howard, Bette Davis and Humphrey Bogart and the fascinating characterizations makes up for its flaws. World on a Wire (Rainer Werner Fassbinder) **** - It's quite hard to believe this film was made in 1973. A mysterious death of a creative director of an institute which runs a virtual reality program called Simulacron kicks off a heady, twisty film on computers, virtual reality and artificial intelligence. That's all one needs to know. This was made before Tron and way before The Matrix and Inception. Yet somehow manages to be more thought-provoking and mind-bending than any of them. The film is almost eerily prophetic on the way it depicts the virtual world. Originally a TV miniseries, the 3.5 hour running time doesn't feel that long at all and it gives you a lot to digest philosophically. Real Life (Albert Brooks) **** - This is the second film I saw this week that was way ahead of its time. World on a Wire tackled computers and virtual reality. This time around, it's reality TV. Writer-director Albert Brooks plays a fictional version of himself as he takes it upon himself to film an "ordinary" family in the course of one year to make a movie out of it. Things don't go quite as planned and the results are hilarious. I'm sure this must have been funny and absurd at the time but currently, it is funny in whole other level. Great performances by the cast. Wow. What an intense, devastating drama. A husband and his wife separate. But an incident involving a miscarriage of a pregnant female caretaker of the husband's father opens up a whole new can of worms. This is one of the reasons why I love cinema. This is an eye-opening look into what goes on in Iranian society. This story can only be told in Iran yet its humanity is universal. The cast is amazing. I also absolutely love the fact that you really sympathize with all the characters involved, which makes this film all the more heartbreaking. It is one of the best films of the year. It's one of the handful of canon films/all-time/top classics I haven't seen and by God, why did I wait so long? This is an amazing film and without a doubt it's one of Woody Allen's masterpieces. The script is funny and nuanced. Although Woody's films are often not praised for their visuals, this one contains some really jaw-dropping cinematography courtesy of Gordon Willis. Despite clearly made and set in the 1970's, it does not feel dated at all. It's a true classic, one of the greats. I love film. I'm passionate about film. Director Martin Scorsese through this magnificent film managed to take that love, that passion and put it magically on the screen through a coming-of-age story of sorts of an orphan boy in the train station. The film is unsurprisingly visually dazzling but more than that, it's also a deeply personal work that obviously comes from the heart and it shows. As someone who likes Martin Scorsese, this is definitely in his top five best films. It's one of the best films of the year and any film which captures why the art of cinema is so wonderful is great in my book. This one is in serious competition with Spirited Away as my favorite Studio Ghibli film or even my favorite anime film. Hell, it's already zoomed in my top ten favorite animated films of all time. A princess from a post-apocalyptic world where a huge portion of the world is toxic and unlivable must stop an impending war between two huge cities. It's got pro-environment and anti-war messages all through out but doesn't hit you over the head with it. Instead you get a visually sumptuous, rousing and exciting science fiction adventure film. This is the kind of film I'd be watching again and again. It's wonderful piece of work. An aristocratic landlord hanging on to his old way of life re-opens his Music Room for one last moment of glory. This is my first non-Apu Satyajit Ray film and it's a great one. 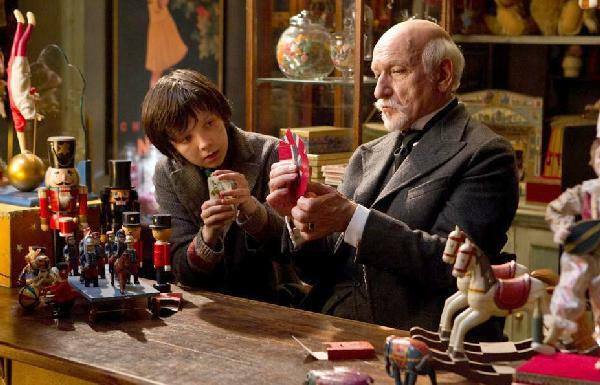 It really is a sad, melancholy film but also oddly life-affirming in its own strange way. It's also filled with wonderful, exciting and beautiful visuals of a lifestyle people outside of India and outside of that particular society seldom see. A repressed school teacher and a butcher meet in a wedding and form a friendship then a series of murder involving young women begin to occur in the sleepy small town they live in. It's a slow burn film which takes time to build but the story that unfolds before your eyes is so layered, complex and thrilling that it had completely won me over in the end. It's exquisite thriller/bizarre love story that is sure to invite repeat viewings and much discussions. I've never heard of this film before it was recommended to me and I must say one of the greatest joys in life is discovering little-known cinematic gems and this is one of them. When a high-born man almost kills his son for disrupting his wedding to a much, much younger girl, he sends him to a religious order of knights. The boy grows up and escapes years later. What follows is a very gripping morality tale of the eternal battle of the spirit and the flesh with lots of wonderful layers and textures on it. 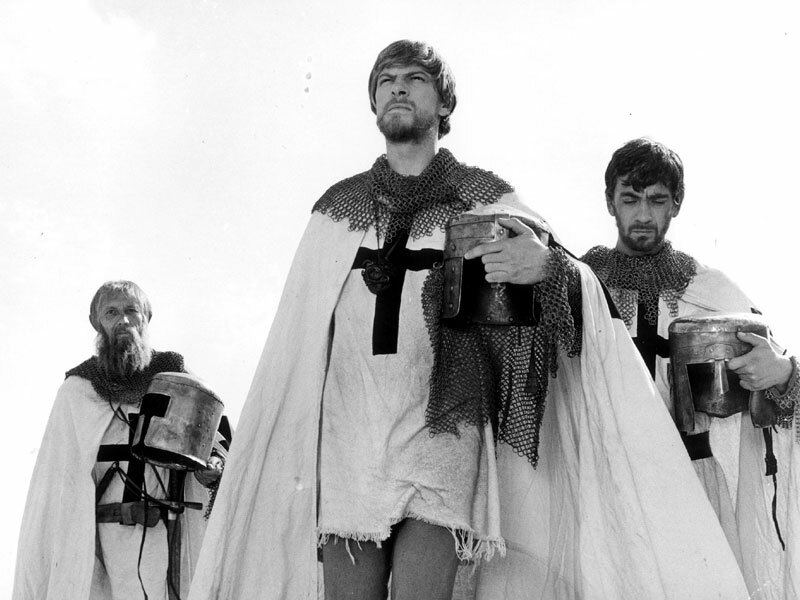 It's sort of like Andrei Rublev with a dose of Seventh Seal in it but not exactly. I just flew three hours in a plane and went to a whole different country. What's the first thing I do? Watch a movie, of course (that's the way I roll). It turns out to be my favorite film of the year so far. The plot is simple: Two 12 year olds fall in love and run away throwing their parents and their town into a tizzy. 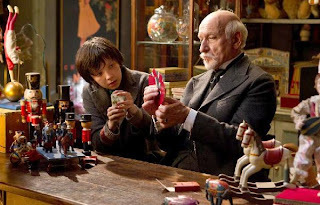 The film is pure Wes Anderson: From the framing, the bright, colorful production design, the music, etc. It's also undeniably quirky, twee, hipsterish, whatever-you-wanna-call-it. In the hands of a less competent director, these types of things often irritate the hell out of me but in the hands of Wes Anderson, he uses it to enhance and complement the story he wants to tell, never sacrificing character and depth. Jared Gilman and Kara Hayward are great as the lead kids and supported very well by the veteran adult supporting cast. Fantastic score, cinematography and design, as well. Three siblings argue and decide what to do with their mother's house and various properties after she passes away. It sounds like a bore but it's anything but. It's a beautiful, lovely, emotional film about loss, memories, family, the changing world and our changing lives. I found it melancholy but also quite life affirming and treats the subject without manipulation or cinematic sentimentality but still manages to be quite emotional. It's a lovely, unforgettable film. The story of Michael Haneke's latest opus is a simple one: After suffering a stroke which paralyzed half of her body, an elderly woman's loving husband tries to take care of her the best he could without going back to the hospital and we see her mental and physical deterioration. There have been many, many films about dealing with illness and a dying spouse but few match the emotion and power this film has. Michael Haneke's signature aesthetic of long, static takes and little to no musical score makes things more real and therefore more uncomfortable and more emotionally devastating. 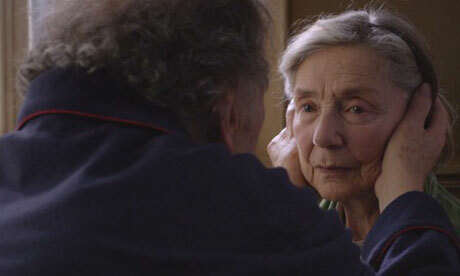 It also helps that the performances of Jean-Louis Trintignant and Emmanuelle Riva are both stunning, it's a beautiful performance duet between the two of them. It's often a tough sit, especially if you yourself have experienced something similar but it's one of the most rewarding cinematic experience you will ever have this year. Truly one of the best of year, perhaps even the decade.